"Melodic, ripping guitar work and catchy chorus" ~ Blues Matters! Check out this month's edition of Blues Matters! They are celebrating their landmark 100th issue and a glowing, insightful review of Shakin' The Dust written by Clive Rawlings is included. The staff and writers at Blues Matters have always been so supportive of my work and I want to thank them from the bottom of my heart for everything and congratulate them on hitting this milestone. Click the link and subscribe! Their name says it all! 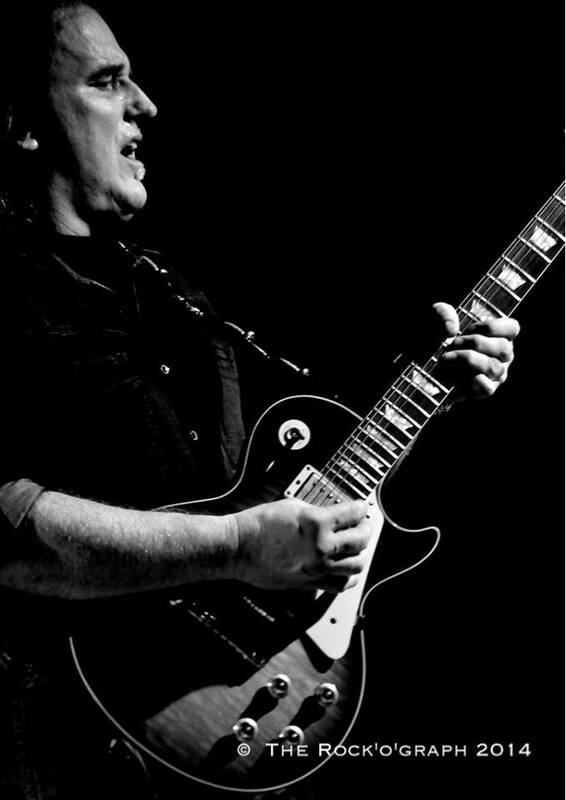 For the uninitiated, Rocky is a Texas guitarist who has been around a good few years, coming to prominence firstly with Black Oak Arkansas, then Buddy Miles BluesBerries and latterly as the last guitarist employed by John Mayall in his Bluesbreakers. He also released solo albums with the late Larry Samford on vocals to great acclaim. So, you will gather he's no slouch and it has given me great pleasure to review this new album. Together with legendary producer, Jim Gaines, this is a cracker from the opening Texas rock of Dictator and the blues rocker, You Pushed Me Too Far, one of many originals with many blues licks. I should give credit here to the rhythm section of Rocky's son, Rocky Athas II on bass and drummer, Walter Watson. Texas Girl is great, too, as it kicks off with an amazing intro with Athas' brilliant guitar complimented by a crushing wave of catchy hooks. Athas puts his own stamp on the Johnny "Guitar" Watson cover, Looking Back, a nice touch being that this version is slowed down somewhat. I Need Your Love So Bad has been covered by the likes of Peter Green's Fleetwood Mac, but it still sounds the business here, very intense slow blues. The most important thing in this song is the feeling that you can put in your guitar strings and that is one of the strongest points of Rocky. It's then back to Rocky's own work again with Not This Time, a melodic rocker again with ripping guitar work and a catchy chorus. The album ends with the magnificent Hendrix cover, Villanova Junction, in which the guitar naturally takes on the leading role and then Athas is at his best. All in all, this is a great album in a long list of great albums by this unsung survivor of the Bluesbreakers. Not that he needs to use that handle. The man is a legend in his own lunchtime, as the saying goes! Shakin' The Dust Unpacks Rocky's Strongest Weapon! Read NOW! Rocky Athas and Shakin' The Dust Delivers Blistering Guitar! Click here to read the full, original review in Dutch and follow Concert Monkey's excellent recommendations. Thank you, Concert Monkey, Walter Vanheuckelom and all the European music fans! For our English speaking fans, a translated version of this review appears at the bottom for your convenience. Rocky Athas is een Amerikaanse gitarist uit Texas. In zijn tienerjaren speelde hij samen gitaar met zijn schoolvriend Stevie Ray Vaughan. Op zijn drieëntwintigste werd hij verkozen bij de beste tien gitaristen in Texas. Thin Lizzy, toch niet de eerste beste band, was zo onder de indruk van het gitaarspel van Rocky Athas tijdens het Mother Blues Festival in Dallas, dat ze er meteen het nummer 'Cocky Rocky' over schreven. In de late jaren zeventig werkte Rocky als sessie muzikant voor Polygram Records in de Memphis Ardent Studios. Daarna was Rocky een tijdje lid van The Southern Rock band Black Oak Arkansas en speelde mee op hun legendarische albums 'Ready As Hell' en 'The Wild Bunch'. In 2002 was hij te horen op 'Blues Berries' van Bobby Miles, de drummer van de Jimmy Hendrix Band Of Gipsy's. De bekende producer Jim Gaines was onder de indruk van de kwaliteiten van Rocky Athas en vond dat Rocky muziek moest maken onder zijn eigen naam. In 2003 verscheen het album 'Miracle' van The Rocky Athas Group, twee jaar later verscheen de opvolger 'Voodoo Moon' en in 2007 verscheen 'Lightning Strikes Twice' en dat was meteen het laatste studio album, want twee jaar later werd Rocky de vaste gitarist bij de Britse blues icoon John Mayall. Als het drukke schema van de nog altijd energieke John Mayall het toelaat, werkt Rocky Athas verder aan zijn eigen carrière. Zo bracht hij in 2014 nog het album 'Let My Guitar Do The Talking... With My Friends' uit. John Mayall, Smoking Joe Kubek en nog wat andere bekende vrienden van Rocky verleenden hun medewerking aan deze cd. In 2015 verscheen 'The Essential Volume I' en in 2016 de opvolger 'The Essential Volume II'. Deze verzamelaars van Rocky's werk zouden hem meer naambekendheid moeten geven in Europa. Op vijftien oktober verscheen Rocky's nieuwe album 'Shakin' The Dust' met daarop elf nummers, die buiten de vier covers allemaal door Rocky Athas geschreven zijn. Producer is de legendarische Jim Gaines. 'Shakin' The Dust' opent met de Texas rocker 'Dictator', waarin Rocky Athas meteen uitpakt met zijn sterkste wapen, namelijk vlijmscherp en verschroeiend snarenwerk. Ook in de bluesrocker 'You Pushed Me Too Far', één van de beste songs op het album, komen de kwaliteiten van Athas als gitarist weer ruimschoots aan bod. Deze 'You Pushed Me Too Far' roept herinneringen op aan Stevie Ray Vaughan. Al meer dan zestig jaar geleden nam Jimmy Reed, het door Calvin Carter geschreven 'I Ain't Got You' op. Het is ondertussen ontelbare keren gecoverd, zelfs door The Rolling Stones en Aerosmith. De versie van Rocky Athas heeft zeker een plaatsje tussen de betere covers en dat komt wederom door zijn fantastisch gitaarwerk. Zoon Rocky Athas II op bas en drummer Walter Watson zorgen voor de heerlijke rock groove. 'Time Flies' is een heerlijke meeslepende rock ballade en de bluesrock shuffle 'Texas Girl' heeft een geweldige gitaar intro. Het langste nummer op het album is de psychedelische ballade 'No More Breath', waarin Rocky weer erg veel gevoel legt in zijn weergaloos snarenwerk. For our English speaking fans, below is a translated version of the review. Rocky Athas is an American guitarist from Texas. In his teens he played guitar together with his school friend Stevie Ray Vaughan. At the age of twenty-three, he was elected by the top ten guitarists in Texas. Thin Lizzy, not the first band, was so impressed by the guitar playing of Rocky Athas during the Mother Blues Festival in Dallas, that they immediately wrote the song 'Cocky Rocky' about it. In the late seventies, Rocky worked as a musician for Polygram Records in the Memphis Ardent Studios. After that Rocky was a member of The Southern Rock band Black Oak Arkansas for a while and played on their legendary albums 'Ready As Hell' and 'The Wild Bunch'. In 2002 he was heard on 'Blues Berries' by Bobby Miles, the drummer of the Jimmy Hendrix Band Of Gipsy's. The well-known producer Jim Gaines was impressed by the qualities of Rocky Athas and found that Rocky had to make music under his own name. In 2003 the album 'Miracle' by The Rocky Athas Group was released, two years later the successor 'Voodoo Moon' appeared and in 2007 'Lightning Strikes Twice' appeared and that was the last studio album, because two years later Rocky became the regular guitarist with the British blues icon John Mayall. If the busy schedule of the still energetic John Mayall permits it, Rocky Athas will continue his own career. In 2014 he released the album 'Let My Guitar Do The Talking ... With My Friends'. John Mayall, Smoking Joe Kubek and some other well-known friends from Rocky lent their cooperation to this CD. In 2015 'The Essential Volume I' was released and in 2016 the successor 'The Essential Volume II'. These collectors of Rocky's work should give him more name recognition in Europe. On the fifteenth of October, Rocky's new album 'Shakin' The Dust 'was released with eleven tracks, all written by Rocky Athas outside the four covers. Producer is the legendary Jim Gaines. 'Shakin' The Dust 'opens with the Texas rocker' Dictator ', in which Rocky Athas immediately unpacks with his strongest weapon, razor sharp and blistering strings. Also in the blues rocker 'You Pushed Me Too Far', one of the best songs on the album, the qualities of Athas as guitarist are again amply discussed. This 'You Pushed Me Too Far' evokes memories of Stevie Ray Vaughan. Jimmy Reed, the 'I Is not Got You' written by Calvin Carter, took over 60 years ago. It has been covered countless times, even by The Rolling Stones and Aerosmith. The version of Rocky Athas certainly has a place among the better covers and that's because of his fantastic guitar work. Son Rocky Athas II on bass and drummer Walter Watson provide the wonderful rock groove. 'Time Flies' is a delightful compelling rock ballad and the blues rock shuffle 'Texas Girl' has a great guitar intro. The longest track on the album is the psychedelic ballad 'No More Breath', in which Rocky again gives a lot of feeling in his unparalleled string work. Legendary Texas Guitarist Rocky Athas and Blues Icon John Mayall End. As some of you may have heard, John Mayall announced today that effective immediately he is reducing his performance format to a trio to become his own guitar player. We had a discussion and a meeting of the minds. John told me that as he approaches 83 years of age this is something he has always wanted to pursue and I support his decision. I have accomplished all that I could as his last guitarist and he wants to finish his career playing guitar for himself in a trio. I want everyone to wish him well and know that even though I will not be touring with John any longer that we remain musician brothers at heart. For me, this is the perfect ending to a great run. Onward & Upward! I look forward to the next chapter of rockin' the blues MY way like the songs from The Essential Rocky Athas - Volume I below. Turn it up & enjoy a taste of authentic Texas music! Although his decision was unexpected, I welcome the opportunity to move forward and continue making music Texas Style with your help. Please "share" my music with your friends and I hope to see you in your city soon! You can read John's official press release by clicking HERE. Rave Review for The Essential Rocky Athas - Volume II! Phillip Smith declares that "The Essential Rocky Athas - Volume II is a delectable album tailor-made for the blues enthusiast" filled with "Texas-style blues riffs". Please click the videos below and listen to the tracks that sparked such enthusiasm. To celebrate the love, SHOP HERE and SAVE 20% OFF all physical CD's by entering promo code FANLOVE20 at checkout. Thank you Phillycheeze's Blues and Rock Reviews for the awesome review! Rocky Athas delivers another ten terrific tracks in the second installment of his Essential series. Volume II was well worth the wait indeed. Heavy-laden with killer Texas-style blues riffs, “You Move Me” kicks this album off with a jamming, soulful groove. Immediately following, Athas then crushes it on “Bluesville”, a beautifully performed heartbreaker. Hope is the foundation of “Miracle”, a silky smooth R&B love song, delicately played with tasty hot guitar licks. The funky bass line and trance-friendly beat in “On the Move” create the perfect atmosphere for Athas to let loose on his ’74 Stratocaster. I could listen to this instrumental all day long. And for a song that really makes an impression, “Survival” gets right to the core, as Athas paints a hellish picture of war, in Warren Zevon-esque bravado. The monster cover of Mountain’s “Mississippi Queen” , however, is the cherry on top of the album. I love this track right down to the glorious cow-bell intro. This song is played loud and often. The Essential Rocky Athas Volume II is a delectable album tailor-made for the blues enthusiast. To read more awesome reviews published by Phillycheeze's Blues and Rock Reviews, please click HERE. Blues Hall of Fame Inductee! Please join me in congratulating John Mayall as he is inducted into the Blues Hall of Fame on May 4, 2016 in Memphis. At 82, John has inspired countless musicians across the globe with his devotion to the blues and his success and longevity is indeed a testament to how "Tough" he is! There is not a better blues harmonica player in the world! Please click below and enjoy my favorite recording from Tough, our first album together in 2009. From the very beginning, John set the tone for this new chapter of his musical life by holding nothing back and I am honored to be a part of it. Congratulations, John! Well done! Read more about the Blues Foundation 2016 Blues Hall of Fame Inductees by clicking HERE and please consider joining the Blues Foundation and supporting their mission of preserving the blues. Click HERE for more information. Photo courtesy of Peter Altenkirch. Awesome photo of John Mayall, the master of blues harmonica, doing what he does best! Blueszine Magazine loves The Essential Rocky Athas - Volume I! Blueszine Magazine describes Rocky's work as "delicious howling guitar riffs" and "immortal music with passionate rhythms" giving the album 8 out of 10 stars! You can read the entire review HERE in Dutch or below in English. Thank you, Blueszine NL! Rocky Athas is een Amerikaanse gitarist uit Texas. In zijn tienerjaren speelde hij samen gitaar met zijn schoolvriend Stevie Ray Vaughan. Op zijn drieëntwintigste werd hij verkozen bij de beste tien gitaristen in Texas. Thin Lizzy, toch niet de eerste beste band, was zo onder de indruk van het gitaarspel van Rocky Athas tijdens het Mother Blues Festival in Dallas, dat ze er meteen het nummer ‘Cocky Rocky’ over schreven. Ook Brian May van Queen is grote fan van Rocky Athas zijn gitaar werk. In de late jaren zeventig werkte Rocky als sessie muzikant voor Polygram Records in de Memphis Ardent Studios. Daarna was Rocky een tijdje lid van The Southern Rock band Black Oak Arkansas en speelde mee op hun legendarische albums ‘Ready As Hell’ en ‘The Wild Bunch’. In 2002 was hij te horen op ‘Blues Berries’ van Buddy Miles, de drummer van de Jimmy Hendrix, Band Of Gipsy’s. De bekende producer Jim Gaines was onder de indruk van de kwaliteiten van Rocky Athas en vond dat Rocky muziek moest maken onder zijn eigen naam. In 2003 verscheen het album ‘Miracle’ van The Rocky Athas Group en twee jaar later verscheen de opvolger ‘Voodoo Moon’. In 2007 verscheen ‘Lightning Strikes Twice’ van Rocky Athas’ Lightning en dat was meteen het laatste studio album, want twee jaar later werd Rocky de vaste gitarist bij de Britse blues icoon John Mayall. Als het drukke schema van de nog altijd energieke John Mayall het toelaat, dan werkt Rocky Athas nog steeds aan zijn eigen carrière. Zo bracht hij in 2014 nog het album ‘Let My Guitar Do The Talking… With My Friends’ uit. John Mayall, Smoking Joe Kubek en nog wat andere vrienden van Rocky Athas verleenden hun medewerking aan deze cd. Nu is er ‘The Essential Volume I’ en deze verzamelaar zou Rocky Athas terug meer naambekendheid moeten geven in Europa, want als alles volgens plan verloopt, staat er volgend jaar een solo tournee doorheen Europa gepland. ‘The Essential Volume I’ is eigenlijk een best off. Negen van de elf nummers komen uit de volgende drie albums ‘Miracle’ uit 2003, ‘Voodoo Moon’ uit 2005 en ‘Lightning Strikes Twice’ uit 2007. We zullen de songs niet in de volgorde op het album bespreken maar wel volgens het album waar ze origineel op te vinden zijn, om de eenvoudige reden, dat de nummers toch kaderen in een bepaalde periode van de gitarist. We beginnen met het oudste album ‘Miracle’. ‘Long Time Gone’ is een knap bluesrock nummer met dadelijk een grootse Rocky op de gitaar. Dit is onsterfelijke muziek met een gedreven ritme en het zit instrumentaal allemaal goed in elkaar. Zanger Larry Samford beschikt over een mooie stem en de heerlijke riffs op de klavieren van Tommy Palmer kunnen ook erg bekoren. Ook in het rustigere soft rock nummer ‘That Was Then, This Is Now’ kan Rocky overtuigen en komt zijn klasse als gitarist boven drijven. Met een paar heerlijk jankende gitaar riffs wordt ‘High Cost Of Lovin” aangevat. Meeslepende gitaar blues om duimen en vingers af te likken. De volgende periode is deze van het ‘Voodoo Moon’ album uit 2005. Het mooiste nummer van het album is zonder twijfel ‘Last Of The Blues’. Een rustige, maar meeslepende blues melodie die gedragen wordt door de warme klanken van het orgel en doorspekt is van erg mooie korte gitaar riffjes. Bassist Guthrie Kennard en drummer Bobby Baranowski beginnen met een lekkere groove, solo aan ‘Tearin’ Me Up’. De diepe baslijnen blijven het gehele nummer door zorgen voor kriebels in je buik en Rocky zet nog maar eens zijn beste beentje voor met zijn uitstekend gitaar werk. De derde periode is deze van ‘Lightning Strikes Twice’ uit 2007. ‘Vows Were Made’ doet dadelijk denken aan de muziek van de grote Tom Petty en kan zo op een album van deze super artiest. Daarmee bewijst Rocky Athas, die het nummer samen met drummer Walter Watson schreef, dat hij buiten een begenadigd gitarist ook een erg goede songwriter is. Hetzelfde duo schreef de power ballade ‘Where Do We Go From Here’ dat akoestisch begint, maar na een halve minuut vallen de andere instrumenten gevat in. Geweldig gezongen en, we vallen in herhaling, weer heel sterk gitaarwerk van de Texaan. Rocky Athas is an American guitarist from Texas. In his teens he played guitar with his school friend Stevie Ray Vaughan. On his twenty-third, he was elected to the ten best guitarists in Texas. Thin Lizzy, not the first best band, was so impressed with the guitar playing of Rocky Athas during Mother Blues Festival in Dallas, she immediately the song "Cocky Rocky 'overwritten. Also, Brian May of Queen is a big fan of Rocky Athas his guitar work. downloadIn the late seventies Rocky worked as a session musician for Polygram Records Ardent Studios in Memphis. After that Rocky was a while a member of The Southern rock band Black Oak Arkansas and played on their legendary albums "Ready As Hell" and "The Wild Bunch". In 2002 he was featured on 'Blues Berries' Buddy Miles, the drummer Jimmy Hendrix, Band Of Gypsy's. The famous producer Jim Gaines was impressed by the qualities of Rocky Athas and found that Rocky had to make music under his own name. In 2003 released the album "Miracle" from The Rocky Athas Group and two years later the successor 'Voodoo Moon'. In 2007 'Lightning Strikes Twice' Rocky Athas' Lightning and that was the last studio album, because two years later, Rocky was the guitarist in the British blues icon John Mayall. If the busy schedule of the still energetic John Mayall permitting, operates Rocky Athas still on his own career. So he brought in 2014 yet the album "Let My Guitar Do The Talking ... With My Friends' out. John Mayall, Smoking Joe Kubek and some other friends of Rocky Athas cooperated in this CD. Now there's "The Essential Volume I" and this collector Rocky Athas would have to give back more notoriety in Europe, because if everything goes according to plan, next year is planning a solo tour across Europe. The Essential Volume I "is actually a best off. Nine of the eleven songs come from these three albums 'Miracle' in 2003, 'Voodoo Moon' from 2005 and 'Lightning Strikes Twice' in 2007. We will not discuss the songs in the order on the album but as the album they originally found on his, for the simple reason that the numbers still fit within a certain period of the guitarist. We start with the oldest album Miracle. 'Long Time Gone' is a fine blues rock song with a once grand Rocky on the guitar. This is immortal music with passionate rhythms and instrumental is all well put together. Singer Larry Samford has a beautiful voice and wonderful riffs on keyboards Tommy Palmer can really captivate. Even in the quieter soft rock song "That Was Then, This Is Now 'can convince come Rocky and his class as a guitarist surfaced. With a few delicious howling guitar riffs is "High Cost Of Lovin 'started. Compelling guitar blues to lick your thumbs and fingers. The next period is that of the "Voodoo Moon" album from 2005. The best song of the album is undoubtedly 'Last Of The Blues. " A quiet but compelling blues melody carried by the warm sounds of the organ and is punctuated by very nice short guitar riffs. Guthrie Kennard bassist and drummer Bobby Baranowski start with a great groove, solo on 'tearin' Me Up '. The deep bass lines keep the whole number by ensuring butterflies in your stomach and Rocky puts once again his best foot forward with his excellent guitar work. The third period is that of 'Lightning Strikes Twice' from 2007. 'Vows Were Made' does immediately think of the music of the great Tom Petty and so can an album of this super artist. This proves Rocky Athas who wrote the song along with drummer Walter Watson, that he is also a very good songwriter outside a gifted guitarist. The same duo wrote the power ballad "Where Do We Go From Here" which starts acoustically, but after half a minute, the other instruments are encased in. Great singing and we fall into repetition, again very strong guitar work of the Texan. While touring in France Rocky had the opportunity to visit with Olivier Carle and TV Rock Live. They discussed everything from getting the phone call from John Mayall to Jimi Hendrix's influence and his connection to other Bluesbreaker guitarists and the future of blues-rock music. Below is the interview in English and in French and you can click HERE to see the published article. Thank you, Yazid, Olivier and TV Rock Live! TvRockLive.com : How did you come in touch with John Mayall? Rocky Athas: I met John when my band opened a show with him in Dallas Texas. We did not speak again until four years later when he called and asked me to record an album with him. I was quite surprised to hear from him after such a long time. John said he had never forgotten how I sounded and he thought I would be a good fit for what he wanted to do. He said he bought and listened to all my solo albums, loved my writing, and that I was his first choice. I was honored. TvRockLive.com: John has played with a whole bunch of talented guitarists, do you know some of them? Rocky Athas: I know Mick Taylor and Walter Trout. We have jammed together a few times. They are both very nice guys. When Walter had his surgery, his record label (Mascot Records) asked me to fill in for him at his album release party in New York City. I was honored to help out because when my son had a tragic car accident and lost an eye, Walterspent time with my son and encouraged him. I will never forget the kindness he showed my son during a very difficult time. We are a community of guitar players that care about each other. I also had the chance to meet Peter Green while we were on tour in the UK. TvRockLive.com: From your point of view why does he change so often and do you think you are in the Bluesbreakers for a while? Rocky Athas: You would have to ask John. He likes to work on the road more than anything and many of his guitar players were not with him very long. I havebeen with Mayall for almost seven years at this point and I am interested in playing with John as long as he wants to keep playing. Luckily, John works about 100 shows a year and that gives me plenty of time to continue my solo career and recording my music. TvRockLive.com: Saw on your website that you played with Black Oak Arkansas, have you got a special link with southern rock bands like Buddy Whittington with Point Blank? Rocky Athas: I did play with Black Oak Arkansas for a while and recorded several albums for them and am still friends with their drummer,Johnnie Bolin. I am so friends with Buddy Whittington, although he never was a member of Point Blank. We are practically neighbors and have known each other for years. TvRockLive.com: What are your main influences as bluesman and as guitarist? Rocky Athas: I consider myself first and foremost a musician with many influences. My friends all started learning guitar by jamming to the blues1 – 4 – 5 progressions because you could spend hours jamming and hanging out with your friends trading off leads and rhythm. Then I was drawn to rock music like Hendrix, and Cream and Mountain because it was fun! Listening to Freddie King was a great influence because he always managed to play a lead with melody. I really like that. Jimi Hendrix and Eric Clapton both influenced me in terms of technique and tones. I consider myself more of a "rock-blues guitarist". TvRockLive.com: You played with Buddy Miles and on the tribute "Blue Haze", what does Jimi Hendrix mean to you? Rocky Athas: I love him! As a kid, the walls of my room were covered inHendrix posters and I saw Jimi play three times. I still remember vividly how mind blowing his performances were! He did things with a guitar that no one had seen or heard before. He was inspiring! I played everyHendrix tune there was including Little Wing, The Wind Cries Mary and Instrumental Solo just to impress audiences. TvRockLive.com: You also played with Glenn Hughes on the Tommy Bolin's tribute, how was it? Rocky Athas: It was a great experience to play with Glenn. He is still one of my favorite lead singers because he is full of soul and rock at the same time. It's nice that I had a chance to play with him. Our paths cross when we are touring Europe and it is always nice to catch up and chat. TvRockLive.com: Have you played in France before? Rocky Athas: Absolument! We play Europe every 18 monthsor so and France is always on the schedule. A few tours ago, we played in France with the Yardbirds and ended up in Paris on my birthday. The guys surprised me with a cake. It was an awesome evening and one I will never forget. I have metwonderful friends when touring the world but none as welcoming as the Parisiens. The last time we were in Paris, some friends took my wife and I on a night time tour of Paris after the show. They took us to the Tour Eiffel and had us standing under it right on the hour to surprise us! It was amazing! The Parisiens are very proud of their glorious city and I was grateful that they shared it with me and my wife. TvRockLive.com: Are your solo albums still available? Rocky Athas: Yes, all of my albums are available online and I have just released a new album called The Essential Rocky Athas – Volume I that includes never before released tracks and information along with some of my favorites tracks previously released and remastered. You can find everything at www.rockyathas.com. TvRockLive.com: Have you got projects outside the Bluesbreakers? Rocky Athas: Yes, Ihave my own band and I am always working on new material and album releases for my solo career. I spend a lot of time in the studio and a lot of time building a relationship with fans on social media with guitar videos. You can check them out on Facebook, Twitter andYouTube. I love answering questions from aspiring young guitar players. TvRockLive.com: Is there any other musician you would like to play with? Rocky Athas: Good question - There are so many! Eric Clapton andJeff Beck would be cool. I have met Jeff and besides being a phenomenal guitar player, he has a great sense of humor. We had an awesome time talking about guitars together. TvRockLive.com: Can you tell me more about your friendship with SRV ? Did you ever play with him? Rocky Athas: We were childhood friends that both played and talked guitars all day at school and on the phone. We were in our own little guitar world. We ate lunch every day at school together and all we talked about was Hendrix, The Who, The Beatles, Cream and all of the great bands at that time. As adults, we never had the opportunity to play in the same band together but always enjoyed each other's company and supported each other's careers. The one thing we truly had in common was our commitment to playing guitar, no matter what. It's what we call in Texas being "a lifer". TvRockLive.com: What do you think of the blues scene nowadays ? Is there any "new" blues band you like? Rocky Athas: The blues scene just seems to continually grow and become more inclusive of a younger generation all the time. It is just awesome when a teenager comes up to me after a show and talks about how much they enjoy the guitar. That is what it is all about for me. Making music accessible and universal. I like all of the bands that are keeping the blues music alive. It is a great form of music because it is timeless and can be molded into a fresh sounding experience if you are creative. TvRockLive.com: Is there any other musical genre you enjoy? Rocky Athas: Rock music is where I got my start and Cream, Jimi Hendrix, Mountain, The Rolling Stones, and The Beatles are still my favorites. They have stood the test of time. I loved playing that style of music but it may surprise your readers to know that I enjoy classical music, too. I also love Stevie Wonder and Marvin Gaye because their voices are such amazing instruments full of melody. That is probably why I enjoyed playing with Glenn Hughes so much. He has a lot of that soul. Good music is easy to recognize. If it moves you, then it is good! I enjoy everything with melody and groove and emotion. TvRockLive.com : Comment avez-vous rencontré John Mayall ? Rocky Athas : J'ai fait la connaissance de John quand mon groupe a ouvert pour lui à Dallas au Texas. Nous ne sommes rentrés de nouveau en contact que quatre ans plus tard quand il m'a appelé et m'a demandé d'enregistrer un album avec lui. J'étais très surpris alors d'entendre parler de lui après une si longue période. John a dit qu'il n'avait jamais oublié mon jeu de guitare et il a pensé que je serais la bonne personne pour ce qu'il voulait faire. Il m'a dit qu'il avait acheté et écouté tous mes albums solo, qu'il aimait mon écriture et que j'étais son premier choix. J'étais honoré. TvRockLive.com : John a joué avec tout un tas de guitaristes talentueux, connaissez-vous certains d'entre eux ? Rocky Athas : Je connais Mick Taylor et Walter Trout. Nous avons jammé ensemble quelques fois. Ils sont tous les deux très gentils. Lorsque Walter a eu ses ennuis de santé, son Label (Mascot Records) m'a demandé de le remplacer à la soirée de lancement de son album à New York. J'étais heureux de lui donner un coup de main parce que quand mon fils a eu un accident de voiture tragique et a perdu un oeil, Walter a passé du temps avec lui et l'a encouragé. Je ne pourrai jamais oublier la gentillesse dont il a fait preuve avec mon fils pendant une période très difficile. Nous sommes une communauté de guitaristes qui se soucient les uns des autres. J'ai également eu la chance de rencontrer Peter Green pendant que nous étions en tournée au Royaume-Uni. TvRockLive.com : De votre point de vue pourquoi John change-t-il si souvent de guitariste et pensez-vous que vous êtes dans les Bluesbreakers pour un certain temps ? Rocky Athas : Il faudrait poser cette question à John ! Il aime être sur la route plus que tout et beaucoup de ses joueurs de guitare ne pouvaient le suivre aussi longtemps. Je suis avec John Mayall depuis près de sept ans et à ce stade je suis prêt à continuer aussi longtemps qu'il le souhaitera. Heureusement, John donne environ 100 spectacles par an et cela me donne beaucoup de temps pour poursuivre ma carrière en solo et enregistrer ma musique. TvRockLive.com : J'ai vu sur votre site Internet que vous avez joué avec Black Oak Arkansas, avez-vous un lien particulier avec des groupes de Rock Sudiste comme Buddy Whittington (ex-guitariste de Mayall) avec Point Blank ? Rocky Athas : J'ai effectivement joué avec Black Oak Arkansas pendant un moment et enregistré plusieurs albums avec eux et je suis toujours ami avec leur batteur, Johnnie Bolin. Nous sommes amis avec Buddy Whittington, nous sommes pratiquement voisins et nous nous connaissons depuis des années. TvRockLive.com : Quelles sont vos principales influences en tant que Bluesman et en tant que guitariste ? Rocky Athas : Je me considère d'abord et avant tout comme un musicien avec beaucoup d'influences. Tous mes amis ont commencé à apprendre la guitare en jammant sur du Blues et des progressions 1 - 4 - 5 parce qu'on pouvait passer des heures à improviser et à échanger des soli et des parties rythmiques. Ensuite, j'ai été attiré par la musique Rock comme Hendrix,Cream et Mountain parce que c'était Fun ! Freddy King a eu une grande influence sur moi car il jouait de façon très mélodique. J'aime beaucoup cela. Jimi Hendrix et Eric Clapton m'ont influencé en termes de technique et de sonorités. Je me considère plus comme un "guitariste de Blues Rock". TvRockLive.com : Vous avez joué avec Buddy Miles pour l'hommage "Blue Haze", qu'est-ce que Jimi Hendrix signifie pour vous ? Rocky Athas : Je l'aime ! Quand j'étais gamin, les murs de ma chambre étaient couverts de posters de Hendrix et j'ai vu Jimi Live à trois reprises. Je me souviens encore très bien combien ses prestations étaient époustouflantes ! Il faisait des choses avec sa guitare que personne n'avait faites auparavant. Il était une vraie source d'inspiration ! J'ai joué tous les airs d'Hendrix y compris Little Wing, The Wind Cries Mary et ses soli juste pour impressionner le public. TvRockLive.com : Vous avez aussi joué avec Glenn Hughes sur le Tribute à Tommy Bolin, quelles ont été vos impressions ? Rocky Athas : Ce fut une grande expérience de jouer avec Glenn. Il est encore un de mes chanteurs préférés parce que sa voix est pleine de Soul et de Rock en même temps. C'est une chance d'avoir pu jouer avec lui. Nos chemins se croisent quand nous sommes en tournée en Europe et il est toujours agréable de se rencontrer et de discuter. TvRockLive.com : Avez-vous joué en France auparavant ? Rocky Athas : Absolument ! Nous jouons en Europe tous les 18 mois environ et La France est toujours au programme. Il ya quelques tournées de cela nous avons joué en France avec les Yardbirds et nous sommes retrouvés à Paris pour mon anniversaire. Les gars m'ont fait une surprise avec un gâteau. Ce fut une soirée extraordinaire et que je n'oublierai jamais. J'ai rencontré des amis merveilleux autour du monde mais jamais aussi accueillants que les Parisiens. La dernière fois que nous étions à Paris, quelques amis nous ont emmenés ma femme et moi pour une visite de nuit de Paris après le spectacle. Ils nous ont conduits à La Tour Eiffel et nous nous sommes retrouvés juste en dessous quand elle s'illumine ! C'était incroyable ! Les Parisiens sont très fiers de leur ville merveilleuse et je suis très reconnaissant qu'ils aient partagé cela avec ma femme et moi. TvRockLive.com : Vos albums solo sont-ils disponibles ? Rocky Athas : Oui, tous mes albums sont disponibles en ligne et je viens de sortir un nouvel album intitulé The Essential Rocky Athas - Volume I qui comprend des inédits et beaucoup d'informations ainsi que mes titres favoris remasterisés. Vous pouvez trouver tout cela surwww.rockyathas.com. TvRockLive.com : Avez-vous des projets en dehors des Bluesbreakers ? Rocky Athas : Oui je possède mon propre groupe et je travaille toujours sur de nouveaux matériaux et des sorties d'albums pour ma carrière solo. Je passe beaucoup de temps en studio et à construire une relation avec les fans sur les média sociaux avec des vidéos de guitare. Vous pouvez les consulter sur Facebook, Twitter et YouTube. J' aime répondre aux questions des jeunes aspirants joueurs de guitare. TvRockLive.com : Y a-t-il un autre musicien avec qui vous souhaiteriez jouer ? Rocky Athas : Bonne question ! Il y en a tellement ! Eric Clapton et Jeff Beck seraient Cools . J'ai rencontré Jeff et en plus d'être un joueur de guitare phénoménal il a un grand sens de l'humour. Nous avons eu un très bon moment à parler de guitares ensemble. TvRockLive.com : Pouvez-vous m'en dire plus sur votre amitié avec SRV ? Avez-vous déjà joué avec lui ? Rocky Athas : Nous étions des amis d'enfance qui ont tous deux joué et parlé de guitares toute la journée à l'école et au téléphone. Nous étions dans notre propre petit monde de la guitare. Nous déjeunions tous les jours à l'école ensemble et tout ce dont nous parlions c'était d'Hendrix, desWho, des Beatles, de Cream et de tous les grands groupes de cette époque. Plus tard nous n'avons jamais eu l'opportunité de jouer dans le même groupe ensemble mais nous avons toujours apprécié nous retrouver et nous avons chacun soutenu nos carrières respectives. La véritable chose que nous avions en commun c'était notre engagement à jouer de la guitare, peu importe quoi. C'est ce que nous appelons au Texas "Une condamnation à jouer à vie" ! TvRockLive.com : Que pensez-vous de la scène Blues actuelle ? Y a-t-il un un nouveau groupe de Blues qui a vos faveurs ? Rocky Athas : La scène Blues semble grandir sans cesse et inclure de plus en plus la jeune génération. C'est tout simplement génial quand un adolescent vient vers moi après un spectacle et m'explique combien ils apprécie la guitare. C'est le plus important pour moi. Rendre la musique accessible et universelle. J'aime tous les groupes qui gardent le Blues en vie (Alive). Le Blues a l'avantage d'être intemporel et on peut aisément le rendre incroyablement moderne avec un peu de créativité. TvRockLive.com : Y a-t-il un autre genre musical que vous appréciez ? Rocky Athas : J'ai grandi avec la musique Rock et Cream, Jimi Hendrix,Mountain, les Rolling Stones et les Beatles sont encore mes favoris. Ils ont résisté à l'épreuve du temps. J'ai adoré jouer ce style de musique mais cela peut surprendre vos lecteurs de savoir que j'aime aussi la musique classique. J'aime également Stevie Wonder et Marvin Gaye parce que leurs voix sont des incroyables instruments pleins de mélodie. Voilà sans doute pourquoi j'ai tant aimé jouer avec Glenn Hughes. Il a cette "Soul". La bonne musique est facile à reconnaître. Si cela vous émeut, alors ça en est ! J'aime tout ce qui a de la mélodie du Groove et de l'émotion. Merci à Yazid Manou ! Gibson Guitars Features Rocky Athas! Read Now! While on tour in Europe, Daniel Eriksson, correspondent for Gibson.com, caught up with Rocky and asked about his passion for collecting guitars. He discusses in detail his prized possession '52, his '59 VOS historic road warrior, and a great story of recovering a guitar that you have to read to believe! You can read the entire interview HERE . Rocky with Gibson correspondent, Daniel Eriksson. Thank you, Daniel, for a great interview! Awesome Review for The Essential Rocky Athas! Read NOW! Acclaimed music reviewer and long time lover of music, Phillip Smith, of Phillycheeze's Rock and Blues Reviews talks about Rocky's "lush and bluesy sounds" calling The Essential Rocky Athas Volume I "energized Texas blues at it's finest". Mr. Smith describes The Last of The Blues "as perfect a blues song as one can get" so please enjoy The Last of The Blues official video below and Go HERE to read the complete awesome review. Thank you, Phil! This week only grab a special discount on The Essential Rocky Athas - Volume I and all other Rocky Athas physical CD's! Click HERE to shop NOW! A Special Life is on the Grammy Ballot! John Mayall's latest album, A Special Life, has been submitted for the first round of Grammy ballots! Fingers crossed that John will receive the honor he is due for his lifetime of achievements in the blues community. Please enjoy listening to Speak of the Devil from that album and join me in congratulating John Mayall! I am honored to have participated in the recording of this album and thoroughly enjoyed getting to put a new twist on this Sonny Landreth classic. John's desire to innovate a classic is inspiring and is one of the reasons that I enjoy working with him. The blues are definitely alive and well and fresh for a new generation to enjoy. Keep rockin' the blues! A Special Life, John Mayall's newest album, is getting rave reviews including one from the Washington Blues Society. I Just Got To Know features Rocky's trademark guitar tone and technique prompting the reviewer, Malcolm Kennedy to comment on the "fine treatment with burning guitar solos"....from Athas. Have a listen and enjoy! You can get your copy today at www.johnmayall.com! Blues Magazine, the premier French blues quarterly, published a beautiful four page feature on Rocky in their Octobre/Novembre/Decembre issue. The in-depth interview conducted by Dominique Boulay discusses Rocky's musical history including who he listened to, who he admired, his work with a Grammy Award winning producer on his solo albums, and his feelings today on being asked to put his signature on classics from the iconic Blues Breakers - John Mayall with Eric Clapton (Beano) album. A portion of the article has been translated below. Blues Magazine: What could you say today about Lightning? Rocky Athas: Lightning was and is my birthplace as a songwriter. It was a proving ground for me and a great foundation. Exploring everything on guitar that a young man would dream of was exhilarating. Playing every gig imaginable, opening shows for huge acts, and trying to impress rock stars who came to watch the show was the experience of a lifetime. I was happy to show them every guitar trick I knew. Fueled by the inspiration of making music and living my dream of life as a musician, my Lightning memories are terrific days and nights filled with music and friends. Lightning had many personnel changes over the years and each and every member was a friend. RA: Good Question. A name that represented the energy that I had for guitar was very important to me and Lightning seemed to fit my style. We were filled with energy for performing music and watching Lightning perform was a very intense experience for the audience. BM: What is your best souvenir of your Black Oak Arkansas’ time? RA: Jim Dandy gave me a Stratocaster during the Ready As Hell recording session. This was the first time anyone gave me a guitar and it was a very memorable day for me. RA: There are no bad memories with Black Oak Arkansas. Johnnie Bolin, Tommy Bolin's brother of Deep Purple and The James Gang fame, was BOA's drummer and we are as close as brothers today. I will be playing the Tommy Bolin Archives Festival in August with Johnnie and look forward to playing with Johnnie again. BM: It is not too difficult to play in a group of Arkansas when you are native of Texas? RA: Not at all, as we were all from the South so our lifestyles were very much the same and we had the same taste in music. BM: Do you work on with The Rocky Athas Group? RA: The MIRACLE and VOODOO MOON albums completed that project. I enjoyed that experience and those musicians immensely Today, I am extremely busy touring and recording with John Mayall and I have a new instrumental solo album featuring an exclusive John Mayall track not available anywhere else. I recorded the new tracks with my son, Rocky Athas II, on bass and Walter Watson on drums. BM: Who is Larry Samford? RA: Larry is a great friend and we grew up in Dallas in the same neighborhood of Oak Cliff as Stevie Ray Vaughan. Lots of excellent musicians came from that neighborhood. We played together for many years. I loved his smoky sounding style voice on record. BM: How do you consider today Miracle, Voodoo Moon and Lightning Strikes Twice? RA: I love those albums but I can't compare them together. Miracle and Voodoo Moon were produced by Jim Gaines for The Rocky Athas Group. Lightning Strikes Twice is a retrospective from my Lightning catalog from the 70's. I am very proud of all three albums, but for me, they represent very different time periods in my development as an artist and songwriter. BM: How did you meet Jim Gaines? RA: We met during the recording sessions for The Bluesberries album with Buddy Miles featuring me on guitar for Ruf Records. We hired SRV's rhythm section, Double Trouble. Jim understands guitar tones so well and it was natural to respect each other's work. He is amazing. We became very close friends and enjoy working together every chance we get. We also write songs together. On Voodoo Moon, Road Fever was co-written with Jim and his wife, Sandy Carroll, who is a songwriter in her own right. BM: What do you prefer to play now, Southern Rock or Blues? RA: I always prefer blues. If you listen to the last album I recorded with Black Oak Arkansas, Wild Bunch, I finally convinced Jim Dandy to record a really nice blues song that I wrote called Dark Purple Blues. This is my calling, rockin' the blues. BM: And what do you prefer to listen? RA: Freddie King. Just yesterday, I was listening to some old recordings from the 60's of him and he still moves me. He is tops in my opinion and his knowledge of the importance of song structure was very advanced. He is the pinnacle Texas guitarist for me. Buddy Miles and I wrote the TEXAS CANNONBALL, on The BluesBerries album, about him. BM: Do you remember how many guitarists have played with John Mayall? RA: I am not sure but I do know one thing, they are all great players. BM: Is it difficult to follow artists as Mick Taylor, Peter Green or Walter Trout? RA: Not at all. John made it very clear that he didn't want me to imitate anyone no matter how classic Eric Clapton may have played Hideaway. John said he had listened to my solo albums before making the decision to call me and he was hiring me for me and he wanted me to put my signature on it. So, that made me feel comfortable right from the beginning. BM: Did you meet some of them before? Coco Montoya or Harvey Mandel? RA: I have enjoyed meeting and jamming with many of them, especially Mick Taylor, Coco Montoya and Walter Trout. BM: Two CDs in 5 years, Tough and A Special Life and how many shows between? RA: And a LIVE in LONDON CD and DVD set! Wow, I guess approximately 700 shows and definitely thousands of miles! John loves the road so we do play a lot! BM: Among them, who do you admire more? RA: Eric Clapton is my favorite not only for his playing but his songwriting skill as well. He has evolved over his career and I respect that ability tremendously. He is always ERIC. BM: The fact of having been chosen is a recognition of your particular style. Are you happy and proud about this responsibility? RA: Absolument! I am very proud of my gig with John Mayall and every night I put everything I have into the show. I hold nothing back. John deserves my very best. I love getting to share the stage with John. BM: It is going to increase your audience all over the world? RA: Since John loves touring so much, reaching a larger international audience is definitely an extension of working with John. We travel extensively in Europe and the US and Canada. One year, John toured Australia and I was lucky enough to cross paths with Jeff Beck and Joe Bonamassa during the shows. BM: You chose to pursue your career as sideman. Does that mean that you put your own activities aside. Either do you consider possible to lead both activities at the same time? RA: That is a very interesting question to answer. I never chose to pursue a career as a sideman. John called and I answered and my solo career has taken a beautiful detour. I don't consider myself a sideman and John didn't hire me to be a sideman. He said he wanted to pursue something new when he disbanded the Bluesbreakers. John never treats me like a sideman and I never perform like one. Since I was an established solo artist when John contacted me for TOUGH, he encouraged me to continue my solo activities from the very beginning and since he usually books approximately 100 dates a year, there are plenty of days to fill with other work. He is so supportive of my solo career that he recorded three tracks with me for my next solo album. He is very kind and generous when it comes to making music together. BM: Do you work personally with sidemen? RA: I never consider musicians that I work with on my solo career as sidemen. I started playing music with the idea of enjoying the camaraderie of friends. I like the team effort on stage where everybody is equal in musicianship and professionalism. Stevie Ray Vaughan shared the same work ethic. He never treated Tommy Shannon or Chris Layton (his rhythm section) as less important than himself. Tommy and Chris knew that they weren't the center of attention and understood that their foundation and stability elevated Stevie and Stevie understood his position. Each of them were secure in their ability. Every musician I choose to work with knows I value their contribution and want to include them in my musical family. I enjoy the chemistry and company of good friends on stage making music with me. BM: Because John Mayall said : “The Band I have now is the best band I have ever had. I think it would be impossible to do better than that.” What could you do in a next future to be better than yet? RA: I always strive to be better and better and continue to evolve as an artist. So whatever the next chapter in my musical career is...it will be awesome! BM: Why do certain people speak about a “further testament to John Mayall’s boundless talent….” He is still alive, him and his music. But can we think on the other hand that bluesbreakers died since your appearance in 2009? RA: That is an excellent question. You should ask John exactly what he feels about that. I am not certain but I think John just wanted to try something new and fresh and different and innovative. While we continue to respect the blues and John's history, John is always encouraging me to bring my own voice to the creation. This is how he approached me and explained his vision for the future. Editor's Note: This interview was conducted before Larry Samford's tragic accident. A tribute to Larry Samford by Rocky Athas is attached. You can get your copy at www.johnmayall.com now! The rave reviews for the newest John Mayall album, A Special Life, just keep coming! Phillip Smith, of Phillycheeze's Rock and Blues Reviews, lavishly praises Rocky as well. "While still on the subject of Louisiana Blues, it'd be a huge mistake to not mention 'Speak of the Devil'. Rocky Athas on guitar sounds absolutely amazing on this one, originally recorded by Louisiana native Sonny Landreth. I've been an Athas fan since his stint with Black Oak Arkansas, and think his style blends with Mayall's very nicely. Athas also stands out on Jimmy McCracklin's 'I Just Got To Know', handing out lush riffs and tasty licks..."
Click the video below to hear what all the excitement is about! Blues Matters Magazine recently featured not one, but two reviews of John Mayall's newest album, A Special Life. Both reviews had glowing things to say about Rocky. In their web edition, columnist Frank Leigh writes, "Rocky Athas is superb." In the print version, columnist Pete Sargeant writes, "'Speak of the Devil' rocks out with great snarling guitar from Athas..."
To read the full reviews, pick up a copy at newsstands or head on over to their website. To hear what all the talk it about, click the video below. Enjoy! Here's that song, for your listening pleasure. Thanks for the kind words, Tom! Rocky had the pleasure of recently being interviewed by Guitarmania.eu. During the interview, Rocky discusses his new album, Let My Guitar Do The Talking... With My Friends, how he feels about being compared to Eric Clapton, and life on the road with John Mayall. The video of Rig Rundown includes Rocky describing his gear for touring.
" ....Leaving us to enjoy the guitar playing of his guitarist, Rocky Athas..."
Pick up your copy of Rolling Stone Magazine to read the complete review, on newsstands in France now. "...whose guitarist, Rocky Athas, recalls the young Eric Clapton." Rocky is honored to be compared to such a legendary musician. Be sure to pick up a copy for yourself to read the entire review, written by Neil Spencer.